Square Pie’s steak and ale pie is a hearty English family favourite. Packed full of juicy meat and veg slowly braised in ale, this home-made-style pie is serious comfort food. These mushy peas are worlds apart from the standard tinned kind. Made from marrowfat peas, they have a fresh, clean taste with no other unnecessary nasties added. No pie is complete without gravy! This rich and smooth onion gravy complements the steak and ale pie perfectly, and is just waiting to be mopped up with mushy peas. Ready-made, there are no lumpy granules to worry about either. Follow this link and add the 3 products to your trolley. Place an order worth £40 or more, for delivery before Friday 13th March. Add the voucher code VOU5661062 as you check out (cannot be used with any other voucher). 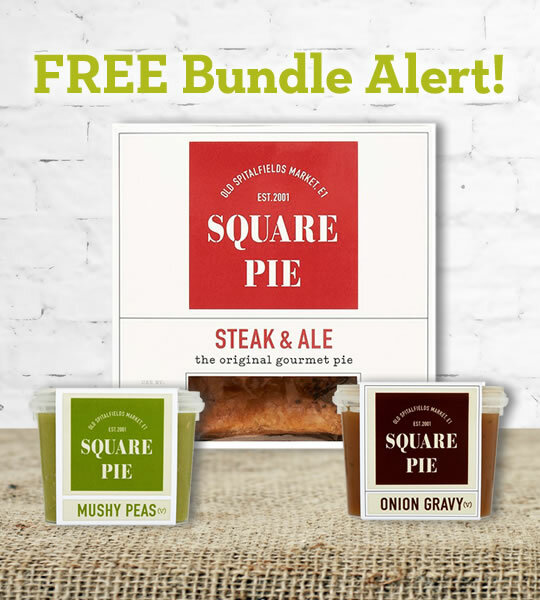 This entry was posted in Freebies, Talking Ocado and tagged dinner, Freebies, giveaway, gravy, mushy peas, pie, Quick Food, Square Pie by Ocado. Bookmark the permalink. hi, I tried to enter this code and it tells me I can’t use it in conjunction with the 2 year birthday code you’ve sent me. That seems a little unfair to me. Thanks for mentioning this – it’s part of our standard terms and conditions but it wasn’t explicitly stated above – we’ve just updated the post copy to make that clearer for any other customers who might be affected too. Sorry that you couldn’t redeem the freebie this time, we’re working on more in the coming weeks so hopefully you’ll be able to redeem another one soon. Just tried to enter the code it says it expired in February! Hi Linda – the 500 bundles were redeemed by 6pm last night, so unfortunately the code would show as expired to anyone trying to redeem after that time. Please keep an eye out for more bundles coming soon. Hi Charlotte, we updated the blog at about 6pm last night to let customers know the offer had expired. Sorry you couldn’t redeem it this time, keep an eye out for more bundles coming soon.